The Reports tab lets you quickly select common dimension and metric combinations that you can use as-is or use a starting point for a custom report. Simply select a report from the list, and the dimensions, metrics, segment, date range and sorting order will be automatically selected. 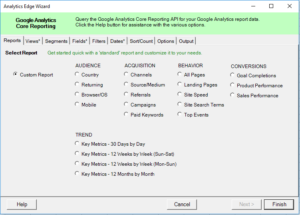 Select from the typical reports, grouped in the same way that Google Analytics reports are provided. 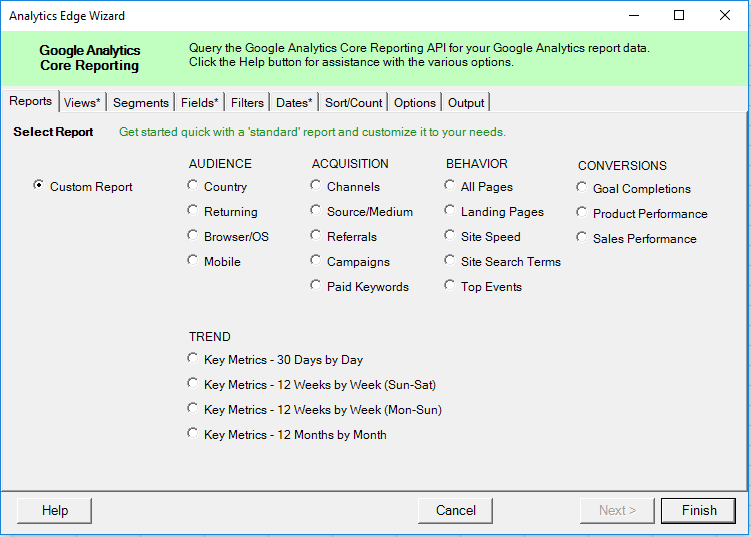 At the bottom are a selection of time-series reports, allowing you to quickly get daily, weekly or monthly key metrics. Go to the Dates tab to modify the date range for the report — all your changes will be saved with the query. This entry was posted in Google Analytics on 2017/11/21 by functions.